Premier Biotech is a leading USA manufacturer of drug testing devices, both urine and oral fluid. 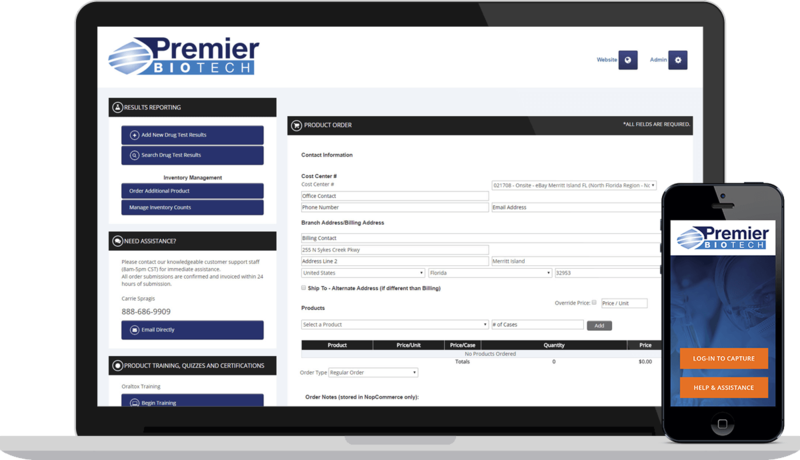 Premier Biotech specializes in working with staffing organizations and we have created products and solutions for saving huge dollars in workplace drug testing while expediting the hiring process resulting in a significant increase in billable hours. While oral fluid testing has been around for over a decade, in the last several years we have seen significant advancements in the testing technology and methodology. Oral fluid tests are now fast, accurate, easy to use, and involve no mess! Each year, more and more of our customers are moving from traditional lab based testing to rapid (instant) oral fluid testing. Our staffing solutions combine top quality, highly accurate drug tests with a customized, cloud based platform we developed to meet the specific and unique needs of the staffing industry. Outlined is one month’s financial impact at one staffing branch comparing our rapid oral fluid products from traditional lab based testing or using a device at a collection site. • On 72 drug tests, they saved $900 in substance abuse testing, and increased billable hours by over $13,000. • This means that if each location increased billable hours by $13,000/month or $156,000/year, a company with 20 offices could potentially increase revenue by over $3,000,000/year. • Additional savings can be realized in background checks. When drug test results are known immediately, background checks are only ordered after candidate has passed the drug test (negative result). Immediate Results Get Candidates To Work And Increase Billable Hour Revenue! National Averages for pre-employment drug testing positivity rates are between 3-4% for urine based laboratory drug testing (Quest Diagnostics Drug Testing Index). This means that about 97% of candidates will pass a pre-employment drug test (negative result) and can therefore, begin work immediately instead of waiting 2-3 days for laboratory test results. Contact Us To Learn More About Our Innovative Urine And Oral Fluid Testing Products And Laboratory Solutions. ©2019 Premier Biotech, Inc. All Rights Reserved. ©2016 Premier Biotech, Inc. All Rights Reserved.